The Bentley Scottsdale Polo Championships: Horses & Horsepower is so much more than exhilarating polo matches. We’re counting down the days with some of the exciting new elements as well as returning favorites. Here’s a quick recap of what’s coming up in preparation for The World’s Most Interesting Polo Event happening at WestWorld of Scottsdale on November 5th! * Bid on contemporary & fine art in the ArtPolo Pavilion by J. Levine: The World’s Most Beautiful Art Auction. Have a unique piece you’re interested in consigning? The process is easy with just a few simple steps. Contact the auction house by calling (480) 496-2212 or emailing them at contactus@jlevines.com to arrange a consultation with one of their in-house appraisal experts. Visit JLevines.com for full details on the consignment process. Interested in bidding? 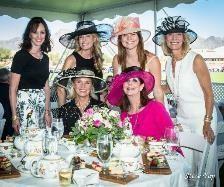 Get your tickets for the ArtPolo Pavilion. We’ll be in touch with additional bidder details soon. * Enter your stylish pup in The Canine Couture: A Dog Fashion Show Like No Other Produced by Oh My Dog! Boutique & Spa; visit their boutique this Sunday, October 9th 11am-2pm for a one-on-one consultation! * Take in the sounds of the Scottsdale Philharmonic, Arizona Opera, Maestro Hughes (as seen on the Grammys) and local hip-hop artist RoQy TyRaiD in the first ever Cultural Concert, which will take place in the new Mark-Taylor Residential Luxury Living Room tent, and concludes with fireworks. * Peruse the many exotic and collector cars from Barrett-Jackson Collector Car Auctions, and local Ferrari, Lamborghini and Corvette clubs. Barrett-Jackson Auction Company and the Barrett-Jackson Collection Showroom are among The Bentley Scottsdale Polo Championships’ Signature Sponsors. If you are interested in consigning a car for the January auction, please visit Barrett-Jackson.com. For more information about the Barrett-Jackson Collection Showroom, please visit Barrett-Jackson.com/Showroom. * See the latest looks from Phoenix Fashion Week in the World’s “Longest” Catwalk. * Enjoy Afternoon Tea with the people who do it best in Arizona: The Phoenician Resort. Tickets and tents in all categories are on sale now at ThePoloParty.com! Premier Sideline Parking is nearly sold out with one spot left. General Admission, including access to all polo matches, general admission tents, car displays, The Cultural Concert and finale fireworks, start at just $20. New this year too are “Twilight Tickets” if you can’t join us until later in the day. All table purchases in the Molina VIP Lounge, the Barrett-Jackson Champagne & Jazz Lounge, and the ArtPolo Pavilion will include a bottle of Veuve Clicquot Champagne.